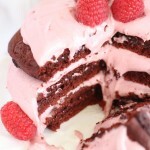 Fluffy buttermilk red velvet pancakes with subtle cocoa flavor, topped with a marshmallow raspberry cream! A sweet and indulgent treat to share with your special someone for Valentine’s Day! I made red velvet pancakes last year as a Valentine’s Day recipe, and I studded them with raspberries. They were delicious, but unpresentable. They were just misshapen and a little too dense. 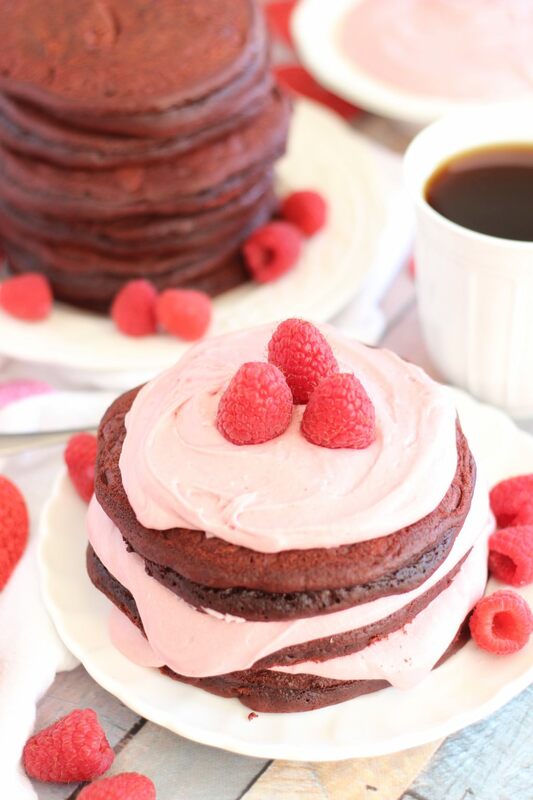 Red velvet and raspberry were made to be together, but the pancakes weren’t nearly as pretty or elegant as I’d hoped. 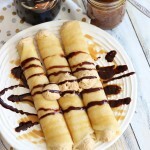 You might’ve spotted those pancakes in my 2015 Recipe Fails, along with a multitude of other poorly executed recipes, and just plain bad ideas! 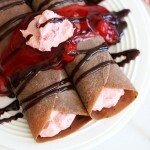 The pancakes were honestly fine, but the real dud was the raspberry topping that I slathered on them. Wrong combination of ingredients, I guess? 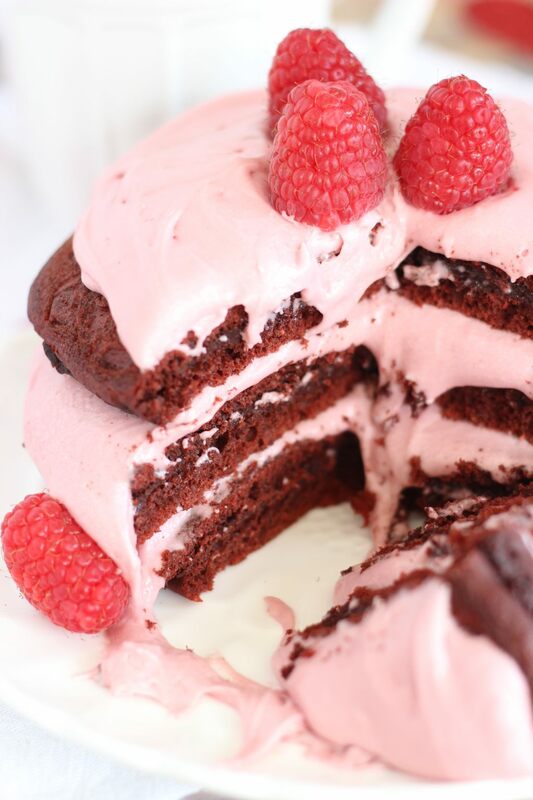 I mixed raspberry jam with buttercream frosting maybe, and cream cheese too… who knows. I can’t recall now, or I’ve chosen to block it out, but it was… not good. Not my finest kitchen moment. This time, I got it right. 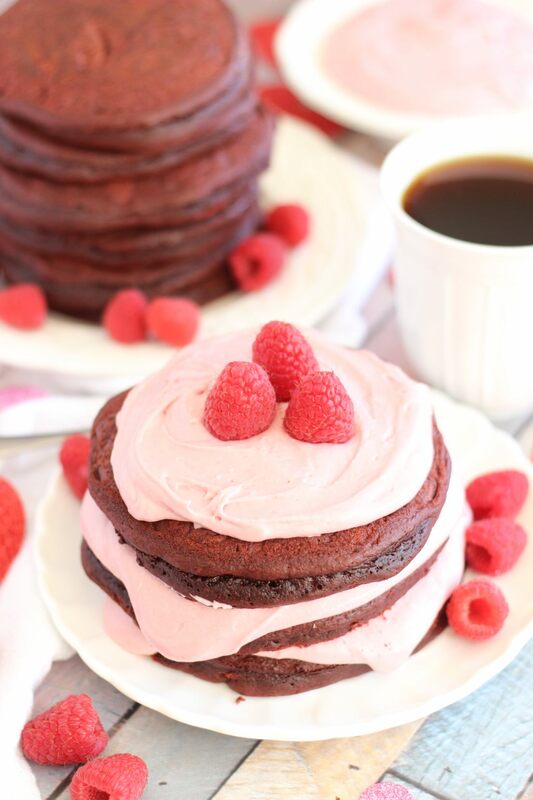 The pancakes are fluffier, yet thick and hearty, with a subtle hint of chocolate, but vanilla flavor too, the hallmark of red velvet! 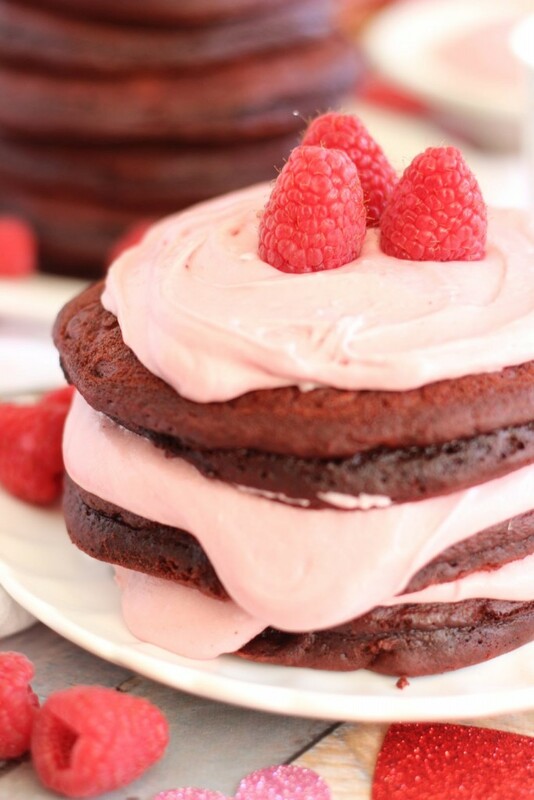 They’re topped with a sweet raspberry marshmallow cream. 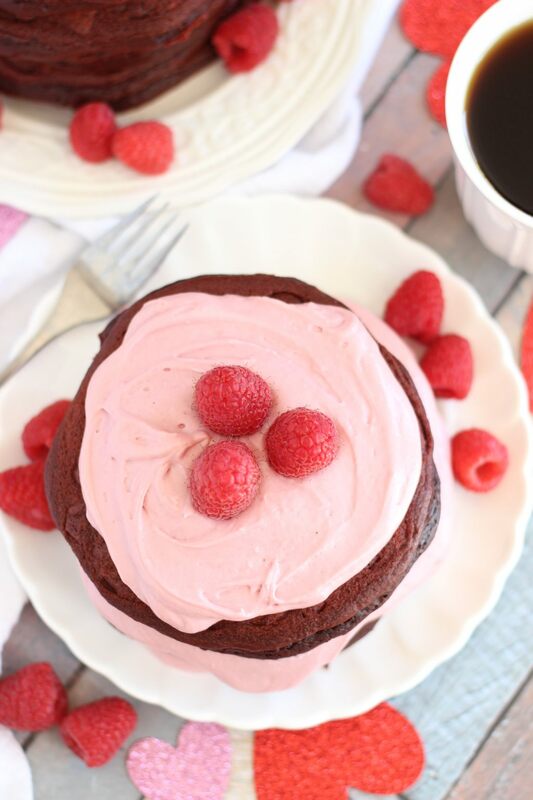 It’s smooth as silk, with lots of raspberry flavor, and it’s sweet without being over-the-top. 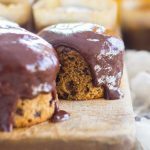 I would proudly serve these to my Valentine this year for Valentine’s Day breakfast or brunch, and it would be to provide a perfect sweet treat for my Valentine, unlike last year’s pancakes where I was making him use them up! 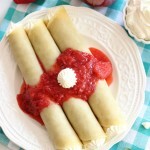 Quick to prepare, you will make a statement that you care, without spending hours in the kitchen! 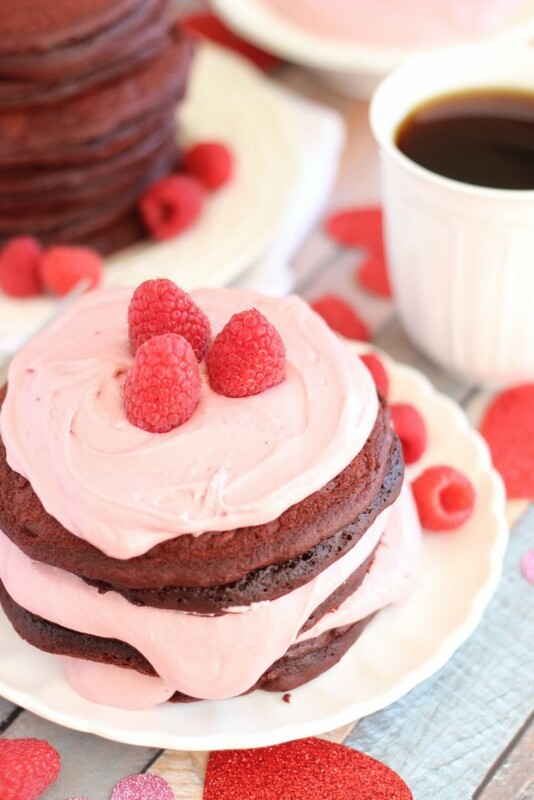 Fluffy buttermilk red velvet pancakes with subtle cocoa flavor, topped with a marshmallow raspberry cream! In a large bowl, combine flour, powdered sugar, cocoa powder, baking powder, baking soda, and salt. In a medium bowl, whisk together buttermilk, eggs, vanilla, and food coloring. Add the wet ingredients to the dry ingredients, and still until just combined. In a pancake griddle or large saucepan over medium heat, pour batter 1/3 c. at a time in rounds, and cook each side until golden brown. Repeat with remaining batter. 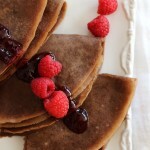 Serve pancakes warm with raspberry cream and raspberries. In a large mixing bowl, combine the marshmallow fluff and shortening, and beat until smooth. Add the raspberry jam and powdered sugar, and beat until smooth. Spread each pancake with about 2 tbsp. 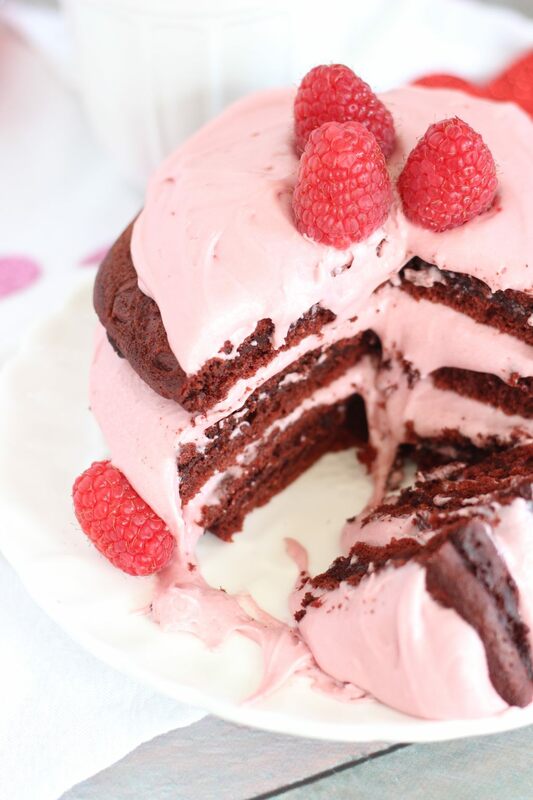 raspberry cream, and serve immediately with fresh raspberries. YUM! 😛 These pancakes look scrumptious! I can’t remember the last time I had pancakes. I can’t wait to try these. Pinning!